Separate to the main house, the barn sleeps 2 / 3 (there is a futon or space for own cot) and offers comfortable accommodation over 2 floors. 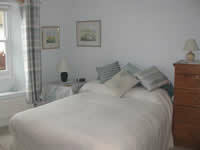 The bedroom is light and airy and the living area has a fridge and tea/ coffee making facilities. It is ideal for couples or 2 friends who would like more privacy. The raised outside deck provides lovely views across the garden to surrounding countryside and the sea. Guests are welcome to relax in the South facing walled garden. Well behaved dogs can also stay in the barn(by arrangement for a small charge). 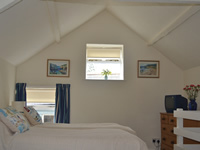 We also offer a cosy double room in the main house with its own bathroom opposite. It looks onto neighbouring thatched cottages and across to Start Bay. A single room could be made available for a couple with a child. 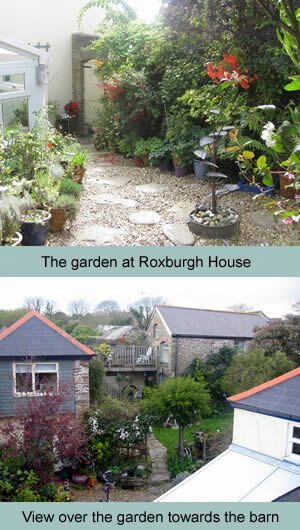 Guests can relax in the delightful walled garden and are welcome to use the owner's sitting room.